Stick Cat lives in the big city. His best friend is named Edith. Every day when their human roommates leave, Stick Cat and Edith get together through a secret hole between their apartments. They do all the usual things two cats would do – look for crumbs on the kitchen counter, dream of bird hunting and search for small, shiny treasures. In the first book, however, their day is anything but ordinary. A violent crash sets off a chain reaction of noises and events. Soon they discover that those events have led to a dangerous predicament for an old, kind man in the building across the alley. It’s Stick Cat’s job to attempt a rescue. To do so, he’ll need to utilize all his smarts – and manage his way around Edith’s charming, amusing – and peculiar – ways. 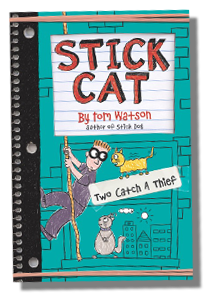 Tom’s trademark combination of laughter and adventure create endearing characters and outrageous action in a story bound to excite cat lovers – and Stick Dog fans – everywhere. While admiring the view, Stick Cat sees trouble. Hazel, the bagel maker, is in serious danger in the building across the alley. 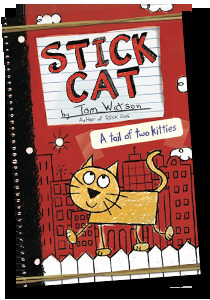 Stick Cat will use his smarts—and Edith’s appetite—to devise a rescue plan. But can Hazel hang on long enough for this dynamic duo to save her? 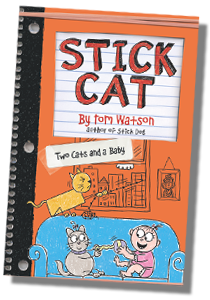 Now that their owners are married, Stick Cat and his best friend, Edith, live in the same apartment. There’s someone else in the family too – Millie, the new gurgling, babbling baby. When Edith declares that Millie’s sounds are actually flattering compliments about Edith, her devotion to the new baby is complete. There’s harmony in the home – until Grandma Cobb arrives to babysit. That’s when things quickly spin out of control. A mishap leaves Grandma trapped inside the bathroom – and locked away from Millie. Stick Cat needs to rescue Grandma. But he also needs to help Edith in her new role as babysitter-in-chief. 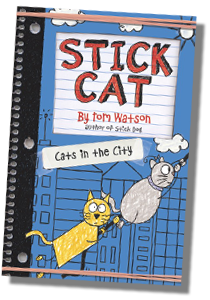 It just might be Stick Cat’s toughest mission ever. To buy these books online, click on the covers.